Learn about our PREMIUM ESTIMATING SPREADSHEET and our new UNIT-PRICING SPREADSHEET. Try Risk-Free today with this SPECIAL OFFER. Tracking estimated vs. actual costs for each line item (called “job costing”) for more accurate estimates. Download Free ESTIMATING WORKSHEET (.xls) to use with Excel to calculate costs and track expenses. Download Free ESTIMATING WORKSHEET (.doc) for a printable “read-only” estimating worksheet. I’ve found the premium version of this estimating program to be a good fit for my remodeling jobs and additions. It’s simple to use and does everything I need. I also do a lot of insurance work where I use Xactimate, the industry standard for insurance repair. Xactimate is great for insurance work, but overkill for my non-insurance jobs. Thanks, for a great program that gets the job done. Please give me a password to access the estimating worksheet. The free version is fully functional. However, if you wish to modify the worksheet, you need to purchase the premium edition which comes with the password to unprotect the worksheet. You can learn more at these FAQs. The premium version is currently available for $14.95 at this link. Any Limitations on Use of Spreadsheet? Is this a one-off payment for the Premium Spreadsheet? 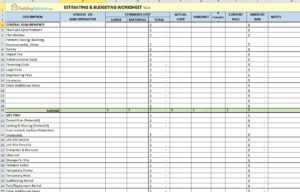 Do you get to use the spreadsheet for different projects? There are no limitations on usage (on up to three computers) and no additional charges. You can use the BuildingAdvisor Estimating Spreadsheet as many times as you like. Just save a backup copy of the original worksheet for future use. You can find more information at these FAQs. The estimating spreadsheet that you have listed can be a very powerful and useful tool for any contractor. I was just wondering: you have it listed as a free as a document, yet when I downloaded it to try to use it, it comes up as protected and a password is required to access it. Can you send me the password to unlock the document, or is there a fee required for the use. Thanks. 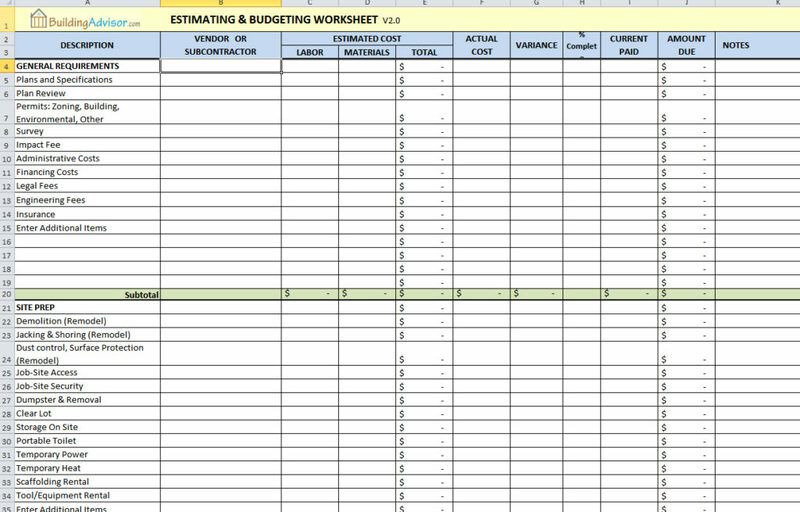 The free Estimating & Budgeting Worksheet is fully functional as is. You can enter cost data and do calculations, but cannot edit work items or make other modifications (other than the addition of a few items at the end of each work category). A premium version of the Worksheet that you can edit or customize as you like is available for $14.95. You can read more about the Free vs. Paid (premium) version at these FAQs. Nice, I like the estimating spreadsheet It’s really helpful! What are good sources to fill in the info for each estimated expense? Creating accurate estimates is the toughest part of the job for many small contractors. Unfortunately, there’s not simple answer to your question. Estimating is often the toughest part of the job for many small contractors. That said, there are many places to go for cost information. For starters, I’d suggest reading through the Estimating section at BuildingAdvisor.com. The two main categories of costs are materials and labor. Material costs are relatively easy to come by. You can often get a bid for an entire building project from a single supplier. This will at least give you a good ballpark estimate, although you may get better prices by shopping around for different types of materials. Labor costs are more difficult to come by. For many costs, you can usually get bids from subcontractors, home centers (that do installed sales), and building supply companies that specialize in flooring, windows, and other product categories. This is time consuming, but you will be getting real costs assuming that you have accurately described the project (scope of work) to each company providing a bid. If you have selected specific products, such as windows, carpeting, tile, cabinets, etc., you will get a more accurate cost than by using an “allowance” that may not cover the product you eventually select. Another approach is to use unit-cost estimating guides, which give average costs for various types of work based on units such as square feet, linear feet, and so on. These are useful for ballpark estimates and as a backup to check your own estimate, but I wouldn’t rely on them to develop a precise project cost. There are simply too many variables that affect actual project costs. Finally, the largest errors in cost estimates are usually items that you have accidentally left out. These are often such things as permits, utility hook-ups, earthwork, landscaping, paving. Use the Estimating Worksheet provided as a checklist to make sure you’re not leaving out any large items. And if you are hiring a general contractor to do the work, you will need to add a percentage for overhead and profit. If you do your homework, you should be able to come up with a reasonably accurate estimate. However, it’s always a good idea to budget 5% to 10% extra for changes, hidden costs, and other unknowns. Most projects end up costing somewhat more than expected; very few cost less.